If you’re looking to invest in a good value multi-room audio system that can handle virtually all streaming services and file types – including the very best in hi-res lossless audio – you’ll not find much better than the updated Denon Heos HS2. We had no problems recommending the original Denon Heos multi-room speaker range, but a couple of minor gripes stopped it from true five-star performance. 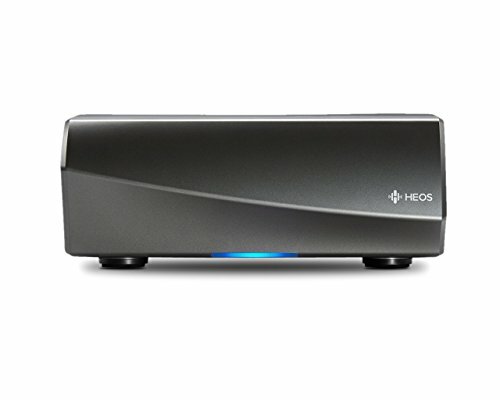 The follow-up, rebooted Heos HS2 range goes all out, offering hi-res streaming support and Bluetooth connectivity. Since the original's launch the multi-room audio highway has got a whole lot more congested though. There's Yamaha's MusicCast system, an updated Sonos, new Libratone, Bluesound and Gear4 products, plus new designs from Bang & Olufsen all vying for your attention. The Denon faces that competition wisely: without a price hike for those new features. It also remains compatible with original Heos products. But does it sound any good? We received exclusive samples of the new Denon Heos 7 HS2 (£379, reduced from £499), Heos 5 HS2 (£349) and Heos 1 HS2 (£199) to find out. The look of the Heos range hasn't changed – just the internal components have been polished – so the Heos 7 HS2 and Heos 5 HS2 both have the same horizontal teardrop design and both are built extremely well with nice attention to detail, well-finished edges and premium quality materials. The top-of-the-line Heos 7 HS2 is pretty hefty and will command attention, while the more svelte Heos 5 HS2 is perfect for a home office or dining room. The smallest speaker, Heos 1 HS2 ditches the teardrop and cloth cover in favour of a smart asymmetrical all-metal grille. Squint and you might mistake it for a deformed Sonos Play:1 – in a good way. The Heos 1 HS2 is sealed for humidity resistance making it suitable for use in the bathroom. We were originally pretty scathing of the Heos's teardrop design – the awkward shape was attractive but it wasn't easy to find space for it on a typical bookshelf, and it lacked the ability to stand vertically or horizontally – but on revisiting the design we've warmed to its pointy ways. With so many boring black streaming boxes available the design is a welcome change without being overly ostentatious. That said, it's hard to not love the latest Sonos Play:5's simpler design more. Connecting your Heos speaker (or speaker) to the network couldn't be easier. There's no hub plugged into your router, you just need to download the Heos app (iOS, Android, Kindle), plug your smartphone/tablet into the speaker using the supplied 3.5mm cable and follow the instructions. It took less than three minutes to have the Heos 7 HS2 up and running. Once all speakers are connected – you can do this individually, but the app should manage the settings automatically to save you inputting the password repeatedly – you can easily create multi-room “zones”. We setup two zones: Dining and Living Room, with the Heos 7 HS2 and 5 HS2; Kitchen with the smaller Heos 1 HS2. Adjusting these is simply a case of sliding one name onto another in the app. If the idea of streaming high-resolution music to a single wireless speaker fills you with horror take some comfort in the fact that any of the Heos HS2 range can be paired and assigned left/right channels for true stereo playback. With Spotify, Tidal, TuneIn, Deezer, Napster, Soundcloud, MoodMix and direct play from your phone's music files, virtually all your streaming needs are catered for via Wi-Fi. But given the hi-res streaming upgrade it's worth pointing out you can also pull music from any network connected music server or NAS drive or via direct input using USB stick (if you are using an external USB drive plugged into one speaker, any other speaker on that network will then be able to access and play that content too). One of the big new features of the HS2 upgrade is the addition of Bluetooth. With a dedicated button on the back of each speaker pairing is quick and the connection reliable. While you are limited to the usual 10m range, if you stream via the Heos app you can extend your Bluetooth streaming around the house by grouping speakers together. Oddly, especially given the hi-res streaming upgrade, Denon have neglected to include Bluetooth aptX - so Bluetooth playback quality is limited, if that's of concern to your needs. While not the prettiest interface we've ever used Denon's Heos App remains mercifully straightforward to navigate. Along the bottom of the app's main screen there are three tabs: Rooms, Music and Now Playing. Pick a room (where you can also create a new multi-room zone), choose your music source and off you go. The Now Playing app gives basic controls over tracks and individual speaker volume. Being able to play different songs from individual sources on different speakers and from separate devices remains a big plus, especially if you have friends or family with exquisite music tastes who prefer a different music platform to you. Of cause, if you're a Spotify user you can sidestep the Heos app entirely and enjoy the simple uncluttered pleasure of Spotify Connect. With the original app some users reported connectivity issues, but Denon has confirmed that a recent firmware update will have sorted it out. We raved about the sound of both the original flagship Heos 7 and Heos 5 and the ability to now stream a higher quality music file to the new HS2 range has only helped to reinforce our opinion. Many users won't be deeply embedded in hi-res files, but for those who do have the relevant streaming services and files it's an added bonus. Even if you're content with “standard” audio quality, there's no taking away from the HS2 line-up's overall quality. The flagship Heos 7 HS2 boasts five custom drivers, two passive radiators and powered five class D amplifiers. In terms of clout it offers more than the superb Sonos Play:5 with a huge room-filling sound and punchy bass. While more adept at playing loud and hard the Heos 7 HS2 can also do finesse. Streaming Jason Isbell's Something More Than Free in CD quality Flac (16-bit 44.1kHz) the extra detail was more than evident with a lovely tone and balance to the mix. The same track streamed via standard Bluetooth (there's no aptX) lacked some of the depth and the acoustic instruments lost a little of their live buzz, but the overall performance was still enjoyable. The smaller Heos 5 HS2 is a great speaker, featuring two mid-woofers, two tweeters and passive bass radiator, active drivers and individually powered class D amplifiers. The drop in quality from the 7 HS2 is noticeable - and given the current discounted price point of £375 if you've got the room the larger speaker is a bit of a bargain – but as a standalone streaming speaker the Heos 5 HS2 is ideal for the bedroom or office. We were unable to pair two speakers to test them in stereo, but have no doubt the result would be a positive one. As for the compact Heos 1 HS2 you get the same bi-amped two-way system, a custom woofer and tweeter powered by a single two-channel Class D amplifier as the original. Although not as good as the exceptional Sonos Play:1 it provides a really great performance whatever the genre. Given its dinky size the Heos 1 HS2 was more than loud enough – and capable of being too loud – for the kitchen. If you're looking to invest in a good value multi-room audio system that can handle virtually all streaming services and file types – including the very best in hi-res lossless audio – you'll not find much better than the updated Denon Heos HS2. The extensive choice of wireless speakers and amplifiers means you can build a complete multi-room system to suit the size of your home and budget, while the excellent Heos 7 HS2 offers enough performance and style to stand alone and impress in most living rooms. At the drop-down price of £375 the Heos 7 HS2 is a bargain, especially given the sound quality is on a par with the more expensive Sonos Play:5, and while not up to the performance of the £595 Naim Mu so Qb you will have enough money left over to kick start your own multi-room system with a £199 Heos 1 HS2.